I'm considering purchasing a condominium with cash in a college town (professional area, not college kids) that costs $200,000 (including cost for renovations). The property would be valued around $230,000 after renovations. I would like to then rent the property for a steady source of income. I am currently in the 37% federal tax bracket and the state tax is 4.25%. I would have no plans of selling the property over the next 30 years. Any thoughts if this is a reasonable idea? Last edited by jeam3131 on Sat Dec 01, 2018 1:33 pm, edited 2 times in total. My gut is: reasonable - yes. But factoring in a) pain in the *** factor and b) concentration risk, I would personally just throw $200k into equities or some sort of tax efficient balanced fund. Maintenance $20/month for a college occupied duplex?? I don’t know the numbers well enough to advise you on those details, but IMO the biggest question is whether you want to be a landlord or not. That means fixing things on short notice whenever a tenant complains, finding and screening tenants. Dealing with potential issues when your college tenants cause issues in the neighborhood, dealing with vacancies. And with college students you will often have to do this every single year for both units. If you farm this all out, it will cost you a considerable portion of your profit. People who do well in real estate tend to be those who don’t mind doing all that work on their own. And/or treat it as a real business where they are actively growing. It’s not passive income. Looking at your numbers you will only net 5.85% per year before taxes. No that is a bad deal an by the way you are way underestimating maintenance. What about plumbing problems? painting? replace the carpet? advertising? bad debts? bad tenants? general broken stuff? So you put up $200k in cash. You get $1650/month in rent. Less $665 in expenses using your numbers. That nets you $985/month in income or $11,820/year. That’s if you don’t use a property manager and do all maintenance and repairs yourself, have zero vacancies and zero long term maintenance issues. That’s less than 6% annually for a big headache when you could simply invest that same $200k and match that return without doing anything. Hi Jeam3131 -- If this is all about max return I agree with the previous posts. Totally agree that the people who do this well do so actively as opposed to attempting to do it passive. The folks I know who are succeeding like this work (because it is work) and are good at it. But if this is about diversification maybe it's a good idea. I have a chunk of cash in an investment property that my son lives in (with my daughter in law) and grandchild. I charge him a below market rate, and he in turn has been renovating the house a little each year in return for the lower rent. There is no question I could be making more money elsewhere, but no way I feel comfortable putting more money in the market, even in low cost index funds. This is a good property in an area outside of Boston that went down less than 6% in the biggest real estate crash of all time (2008). I like having some money in something I can actually see, drive by and touch. Some things you do because they just seem safer (all things considered and who the hell really knows) than other things, and you sleep better. You could look around and get a 3% CD, maybe more, with deposit insurance. If you need the money, you break it and sacrifice a little interest. Your anticipated real estate returns seem a bit rosy. If you need the money you invested, you have to find somebody to buy the property. Sometimes that's not so easy. Never use cash to purchase real estate, even if you can afford it. I keep a large cash allocation at all times and I still use leverage. That is the only way to unlock most of the 5+ ways that real estate pays you. Here is an example I outlined earlier how a $20K down payment on a $100 property pays you in real estate. Buy a property at $100K, $20K down. Monthly rents of $900-$950. I personally buy in markets with 6-8% long term appreciation, but lets be very conservative and use the general longer-term real estate appreciation value across the entire U.S. - 4% annualized. Even though nobody buys every single house in the U.S. Appreciation of 4%: 5:1 Leveraged return of 20%. 20% + 8% + 4% + 3.75% + 3% = 38.75% annualized return on your $20K down payment. The kicker here is that rental real estate returns almost universally grow every year because if your expenses increase at the same level as rents, the way the math works, the difference becomes greater every year (kind of complex to explain here, so we can forget it and assume the 38% return). An index fund will only pay you in one way (capital appreciation). A 1.8% dividend is laughable and is not significant enough to count as real cash flow. To date, I have legally not payed any taxes on my real estate income since I started investing in 2012. The beauty of real estate is that the tenants pay your mortgage and expenses, and the tax benefits. The cash flow and potential appreciation are only a bonus. This forum has a very "anti-real estate" vibe but I have seen lately that people are interested in the truth above all and are looking for other options. Some want to invest in something that will provide income now, not when you are old (or dead). Using leverage, no thanks. What happens when the bank(s) call your note(s)? You’re in a jam then. do you want to be an active investor or passive? I have a full time job so I'm not intested in working on my investments too. That's what investing in physical real estate is, a part time job. Some will say you don't work that much. Maybe. Guess it depends on all sorts of factors like quality of the tenant, location, etc. You should have enough cash on hand to keep paying the mortgage in the event your tenant stops paying and you cant' get them out for months (every jursidiction differs). Some judges are lenient to deadbeat tenants. Landlords like to go through mediation when possible instead of going through the Judge for eviction as a result. Having multiple properties helps with cash flow issue if you have cash needs with any ONE property you own (repairs, etc). Just saw a bogleheads post about a $10,000-$20,000 repair for a sewer line repair (viewtopic.php?f=11&t=264842&p=4231113). That sounds like fun (not). Make sure to have cash on hand because it will take a little while to build that up with the net rent after expenses. See what I mean? How interested are you in going to court to evict tenants who don't pay? How will you feel when you don't get paid for months? How will you feel wondering what your tenants are doing to your property? See where I'm going? My family owned lots of real estate over the years. Most was alright, but there were nightmare stories too. Diversification is the only free lunch. Wouldn't you want your real estate holdings to also be diversified? And leave the real estate investing to the professionals. Do you think you could do better than them considering that's what they do for a living and you're looking to do this as a side-gig? Last edited by arcticpineapplecorp. on Sat Dec 01, 2018 4:39 pm, edited 4 times in total. Note that @WanderingDoc pushes real estate hard here using excessively rosy numbers. The numbers he painted are not targeted at jeam3131’s actual situation. It’s a boilerplate quote he pulls out in every real estate thread. By his own admission he is highly leveraged and has only been in RE since 2012. Leverage is great when markets are going up. How exactly would a bank “call” your mortgage? If the OP is doing this for financial reasons, it’s a no brainer to use leverage. But I have seen that many people don’t really buy real estate for financial reasons alone. The emotional comfort of “owning” is a factor as well. "By his own admission" Huh.. Do you enjoy making things up? I have never said I was highly leveraged. Search all of my posts. I am actually under-leveraged. Across my portfolio, I am now about 40% LTV. That is extremely conservative and quite low in the real estate world. The reasons that the LTV dropped that low was because of principal paydown by tenants and capital appreication. I would prefer more like a 65-70% LTV for my risk tolerance. Take a look at my numbers in that example, they are rather conservative. It seems high to you because you have been told to be happy with 8% returns. The truth is, I have several properties which I have less than $10K of my down payment in (cash out refinance) and they generate more than $12-15K in net rental yield annually. This requires one to have some real estate knowledge though, so I never claim that >100% returns are "normal" but if you can do it why not. 40% as outlined in my example is conservative. Just another "scare tactic" and "doomsday" myth perpetuated by those who convince themselves that real estate is bad. Another favorite of mine "I don't want tenants to call me at 3 AM for a leaky toilet"
I have properties that I manage and others with a PM - to date I have not received a call about a leaky toilet in the middle of the night. Totally agree. Mathematically and financially its better to leverage in real estate. There is always that emotional comfort of "owning" it 100%, but I would argue that should be reserved for personal home you live in, not an investment. If I get into REI, wouldn't I want cash flow over ROI? I could get infinite ROI if I made $1 on a $0 down loan. That seems silly to me. All that gives me is braggin' rights on the Bogleheads fora. What I would really like to do is take $400k and have it generate $40k/year in net cash flow. That sure beats the alternative BH way of needing 25x $40k ($1M). Or worse, 30x or 40x. That is what leverage could do. That's why I joined BiggerPockets.com and started reading his books, listening to his blogs and webinars. Wanderingdoc, can I give you $400k, you give me $40k / year (10%) and you can pocket the difference. Based on your math, that should be about 28.75% for you, right? RE is great, why not look for something that will net you more? 5%ish isn’t that great. Aim for 8-10%. Also, you should consider mortgaging a multiunit building for 1Mill with 200K down. Your mortgage would be approx $5,000 all in and you’d probably bring in a considerable amount of rent. I’d aim for $8-10k/month. I own one rental property (a duplex). I live in the property, and like owning my own dwelling outright. I don't mind not having a mortgage on it, but if I were serious about real estate the smart move would be to use leverage. Not using leverage on real estate is dumb, considering the tax advantages in the US. ...Diversification is the only free lunch. 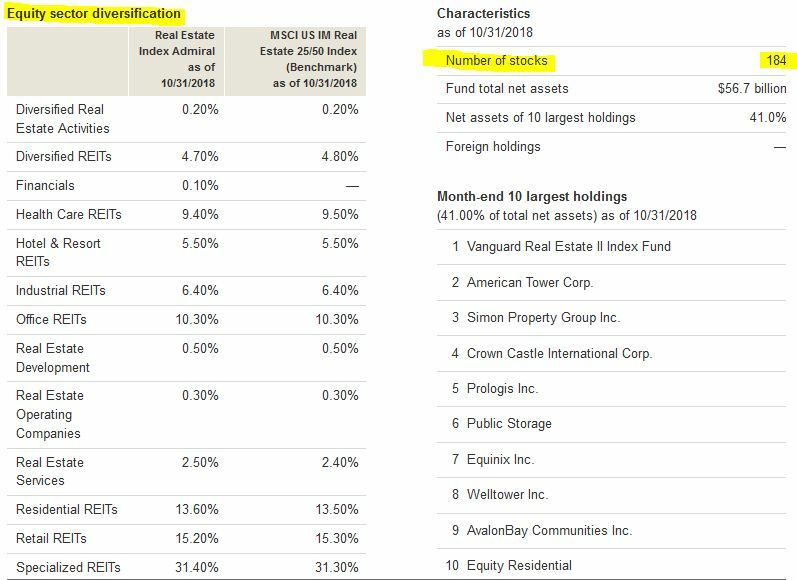 Wouldn't you want your real estate holdings to also be diversified? And leave the real estate investing to the professionals. Do you think you could do better than them considering that's what they do for a living and you're looking to do this as a side-gig? That "free lunch" isn't actually free. Those professionals that you "leave the RE investing to" pay themselves professional-level salaries that you have no say in and that come right out of the properties they invest in. In other words, right out of your pocket. And there are lots of them in any big project. DW and I did very well in RE as a side-gig. BUT we worked at it. In fact the whole family worked at it. And therein lies the road to initial success in RE. Sweat equity. If you are not willing to put your own time and effort into RE, buy equities. If you are willing to put your time, effort, and sometimes physical labor, into properties you can do a lot better than stocks, and you will be diversifying your human capital. You have a side-gig in case of job loss. And, you can do much better than the professionals because you can operate on a smaller scale. No REIT is going to even look at a SFH, no matter how good an investment it might be. For an individual it a meaningful part of his portfolio and is worth time and effort. The only advice I really have for the OP is that I have always avoided condominiums. A SFH is almost always more desirable than a condo both in terms of rental potential and price appreciation. Eventually enough SFHs lead to a situation where multifamily buildings are the next logical step, but these are 4-plexes or even apartment buildings, but still not condos. You should use some amount of leverage and consider a more realistic maintenance cost. 0.1% annually is not realistic for an older home. Are you planning on using a property management company or not, seems like no from what you posted? I assume the rent estimate is based on comparables? Use leverage. Why tie up $200k in cash? Take 20% of that and control the same business. Use the rest for reserves or other opportunities. Consider property management and do your due diligence. There are actually SFH REITs which was partly a consequence of the last recession’s mass foreclosures. This presented attractive opportunity to build large portfolios of SFHs on the cheap. yes real estate is great as long as all goes well. Also, the best real estate return is on the house you live in. Pay it off and your $2500.00 dollar a month now goes in your pocket guaranteed with no hassle of tenants. Then move on to real estate investing after this. All the real estate investors (5-10 houses) I know lost everything in the last housing crash. Why, to much leveage out there. I had property and sold before 2007. Not that I knew anything but I did not want to deal with tenents and the prices I sold the house for were crazy. So, I say I got lucky. Landlording is an extra job. Question is whether you want an additional job that pays what it pays. I bought a 2-family home in a very HCOL area and my extra job has paid well, but there are times (difficult tenants, usual household maladies x2 etc) when it can feel otherwise.I have the benefit (?) of being literally on top of my rental unit so no travel time to fix stuff. And there's always something that needs fixing. In a local landlord class I was talking with a local investor who owns over 100 houses and also a property management company, we went through some analyses of properties back in 2015. None of them made sense. They stopped buying in 2014. They also stopped buying in 2005. They use the high period to sell their suboptimal properties and hoard cash. Basically their advice was in real estate to only get properties that significantly cash flow, and the only time that makes sense is in a down market. Outside of uber hot markets there will always be a down market around the corner. We are in a market where housing appreciates at the rate of inflation, so the appreciation isn't factored into the equation. And even then. I live in London which has had something like a 5-6% real return every year since 1994 - nominal prices have risen about 5x since then. The 10-20% drop in 2008 was quickly caught up. But, we are in a slump - -10-15% since the peak in say 2015 before the Brexit vote. History says that of course it will shoot right back up again once the Brexit uncertainty has waned -- of course. There are markets like San Francisco that appear to basically have had no dips - but even SF was down in 2000-03. Adjusted for quality, it appears that in the long run US housing does not exceed inflation? At least I think that's what Shiller found? There is evidence of a structural shift, in the last 30 years, around certain coastal cities where planning controls prevent expansion - where real housing prices in boom times are sustained in bust times. So NYC SF Boston Washington DC SoCal perhaps Seattle? But not Atlanta, DFW, Houston, Sun Corridor or Chicago. However it's fairly easy to point to each of those cities and identify the industry which has driven that growth - media/ entertainment, technology, financial services. With the exception of Washington DC none of these cities would do well if one of its key industries became the next auto industry*. * my sense is it is financial services which is far and away the most vulnerable. It's easy to outsource, and it's not performed very well by existing incumbents, and technology offers the opportunity for quite radical changes - mobile banking startups, for example. You need to allow for vacancies. 5% is a reasonable number, but it could be more or less depending on market conditions, the property itself, and how well it is managed. $20 a month for maintenance is way too low. Think about what it costs to replace carpeting. You need to account for management expenses. Even if you do it all yourself, you time is worth something. There is a sizable transaction cost when you want to sell. When I use what I think are reasonable numbers, I get about a 7% return on equity. Meh. As others have said, you can goose that return with leverage. Buying two of them with 50% leverage would put you up around 10%. In general, I find that people who dabble in investment property (as opposed to getting into it in a bigger way) are ultimately bound to be disappointed. Also, be mindful of the fact that condo associations tend to rather hostile towards landlords. ...We are in a market where housing appreciates at the rate of inflation, so the appreciation isn't factored into the equation. One of the huge advantages of RE is the leverage that is commonplace and not overly risky. If I put 20% down and the whole house appreciates at the rate of inflation, my equity appreciates at 5 times inflation. Not near enough return on equity, sorry. I have one single family home that we own and rent. $35,000 purchase, $650/mo rent. First year maintenance was $3500 sewer line, second year $4500 HVAC. Those are atypical repairs but nonetheless the outlays were required. $20/mo maintenance isn't near realistic. Good luck to you. We are looking for a second rental now. That is an incredible investment. You wouldn’t find anything near that even in the most socially deprived areas of the U.K.
Why does the valuation stay so low for such an incredible investment? We live in one of the lowest cost of living areas in the center of the US. Our primary home is 3 bed, 3 bath, 2 car garage, covered rear deck, 2005 construction, 1750 Square feet, $121,000. The market is up a touch since we bought the first rental. We have $60,000 on hand and it will be just a touch larger than the first. We pay cash and haggle hard and since we don't need it, we walk if they won't discount. The $35,000 was asking $52,900 and the $121,000 was $142,000. I was thinking about you before looking at your username, i remember earlier this year and last year you always backed real estate. I finally bought my first place in August, 3 bed 2 bath single family home for 190k. Currently living in one room and renting out the other 2 to my friends (who have been great). Hoping by 2021 to get my second place, rinse and repeat. I dipped my toe into real estate investing back in 2015. I live in a LCOL part of Florida. I bought an investment property in a blue collar neighborhood in October 2015 for 55K. The house had been completely remodelled, new roof and new AC. I used a Property Manager, and financed the property with 25% down from me. I found a really nice spreadsheet online where you can plug all of the numbers in (including maintenance and vacancy rate) and generate a pretty realistic ROI and cashflow. My experience was that the numbers tracked pretty close to my estimates, except that I had a bad tenant that caused some damage and skipped out. The other factor was that the neighborhood seemed to be going downhill, and I didn't like being a landlord in that sort of an area. The local crime seemed to be centered in that part of town. Fast forward 2 years, I decided to sell. The good news is that I put no money into the place other than fixing the damage and sold it for 83K 2 years later. I decided to sell because values went up and I figured it would take me a long long time to net out the profit I would realize from the sale. Lastly, I just felt like I was always waiting for the next shoe to fall. So, net net is that I made some money and kept my overall risk pretty low. 1. Less than 6% returns is marginal given the possibility of a longer term vacancy due to unit damage, litigation, etc. However, depending on the circumstance and "deep pockets" and your goals, it can be fine, or great depending on potential appreciative value. 2. Would you be managing it yourself? 3. Are you able to do minor repairs yourself? 4. Is this your first rental unit? 5. Do you have other rental units in the area? 6. Are you planning to expand your business in property development and rental income? 7. A lot depends on your overall personal financial scenario, including existing portfolio assets, employment, income streams, etc. Post a "portfolio review" so that forum members can see things in context and you'll get more comprehensive input. Without doing this, it's just looking at a small part of the "elephant". Leveraging is good. But paying cash is also good. It depends on your goals, "deep pockets"/financial situation, and attitude/approach toward rental income, property development, etc, etc. There are many ways to approach this. Some work great for others. But that doesn't mean it fits "you", or everyone. This I can be a good idea depending on your approach and again, financial scenario beyond the details you've posted. Suggest reading posts by "denovo" on rental income and so forth. Also "sandtrap" (more multi unit and commercial oriented) though "denovo" has things far more well written and "broader" in viewpoint. There are others with more specific viewpoints and experience (SFH, commercial, high rise, sole business, side business, etc) unique to them. Explore the "bigger pockets" forum but tread carefully. Last edited by Sandtrap on Tue Dec 04, 2018 12:01 pm, edited 4 times in total. And so does your depreciation. This is the lose your shirt in real estate issue that can show up. I was looking at San Francisco zoning maps, it's astonishing that so much of the city itself is zoned at the lowest density. It is unnatural. The zoning will eventually go the way of Minneapolis 2040, with upzoning. I don't think values of sfh's will go down there, as it's mostly land value, but prices of prefabbed condos should certainly not be 1MM for a 2br/2ba, since they can fabricated for a couple hundred thousand and the land premium over lcol would only be another couple hundred thousand per unit. It's not a great idea because the rent to value ratio is reasonable but not great. You could also consider ownership in a crowdfunding sort of REIT, which I do in Fundrise. They participate in building apartments and other housing in various parts of the country, as well as some house flipping, particularly in high-demand areas like LA and DC, and you can invest according to your needs, whether it's income or growth or a combination of both. It's not as liquid as a traditional REIT, but then the shares aren't traded on a market, so they tend to stay around $10, and pay out usually 7-10% in dividends, as well as sharing in gains when the properties are eventually sold. The combination of diversification and leaving all the worries/time demands is worth the risks to me. Your numbers are missing some data. Maintenance is more like 200/mo. Some cities will institute a rental license in the range of $100/yr. Now how does the cash flow look? What happens when these funds decide to dump all these SFHs at the same time? You drive from one end of the UK to another in a day. You can't even drive across Texas in the same time. US has 40x the land, but only 5x as many people. There are no properties anywhere where I live (at least not in neighborhoods you risk your life being in) where you will get almost 1% of the purchase price as the monthly rent. As pointed out by someone else above, these numbers are rosey. You use the area where your properties are (which we don't know where they are) as applicable to the whole nation. 1. Markets with 0.8-1.1% rent:PP ratio are aplenty. All over the U.S.
2. No one forces you to buy only in your backyard. This is the 21st century. How do rent a place far from where you live? How do you manage it? Those are added costs. There are risks associated with that- you don't know areas, neighborhoods, etc. Again, rosey, rosey, rosey. Not that it surprises me. The above example is a turn key property, fully rehabbed and fully managed by the firm for you. Very little work on your part. In my personal portfolio my returns are much better than that since I usually do a cash-out refinance pulling out most or all of my down payment, where the returns are infinity/non-defined since I have none of my money in the deal anymore. To do a cash-out refinance you would either have to buy below market value or wait for the property to appreciate, usually both if you want to do it in a couple of years or less. I'm not even accounting for finding great deals, financing tricks, or building relationships with other investors or brokers, which will yield even higher returns. I'm talking about a run-of-the-mill property in Middle America to demonstrate the five profit centers of Real Estate. The above property is actually one of my own (near identical numbers) where I bought a turnkey property as an experiment to see how it would turn out. What you see is the worst performing property in my portfolio but I just used it as an example. I am a real estate consultant and have practiced for over 40 years. My simple advice is to stay away from real estate investments unless you are very sophisticated. Purchasing individual units either ,multiple family or single family is not desirable unless you have a lot of cash to dispose of and you wont evened the money. You can always play with the number and make them work or not work. Leave real estate to the pros unless you desire to live there. Not sure. Is a real estate "consultant" a Realtor or Broker?